I was fresh out of school working as an apprentice at my first real HVAC job and I was listening in on a shop conversation between a few techs. They were talking about finding so many overcharged systems and one of the techs turns to me and says “I had a unit yesterday that was so overcharged it was running minus five degrees of superheat”. I don’t remember EXACTLY what I said in response to that but it started a miniature argument and set me on a crusade against misinformation that led me here all these years later. Before we move on I want to mention something that Jeremy Smith pointed out to me. When working with a zeotropic refrigerant blend that has “glide” the change from liquid to vapor and vapor to liquid occurs over a range of temperatures and not at a single temperature. When calculating superheat we use the “Dewpoint” and when calculating subcool we use “Bubble Point” the saturation temperature is the range of temperatures between those two points meaning that it could be “interpreted” as negative superheat or subcool when it is actually just in the saturated range. In air conditioning, the traditional R22 and R410a refrigerants do not have any significant glide but newer blends do so it is something to watch out for. Here is a list of things that if you observe them, it will be worth checking your tools to make sure they are set up correctly, connected correctly and properly calibrated BEFORE you start making an exotic diagnosis. Superheat is the temperature gained in the refrigerant once it is completely boiled into a vapor. When it is still in the process of boiling it will be in a mixed state and will be at saturation temperature for that given pressure. Zero superheat is something you will see often when a system has a flooded coil and liquid still boiling in the suction line. While this generally isn’t a good thing it is something that you will observe from time to time and will usually result in you as the tech taking corrective action. Negative superheat goes by another name SUBCOOLING and the only way a substance can be in the subcooled range is if it is 100% liquid and has given off additional heat below the saturated (mixed) state. It is impossible in a running air conditioning system for the suction line to be 100% liquid subcooled below saturation, therefore it is impossible to have negative superheat both by definition or in practice. So what happens when you measure negative superheat you may ask? Good question. Just like we mentioned above, negative subcooling is superheating. There is no such thing as negative subcooling. Is it possible for the liquid line to contain superheated vapor? It is THEORETICALLY possible but not practical. For example, if someone short circuit nearly the entire condensing coil and connected to the liquid line you could see superheated vapor…. but let’s be realistic. 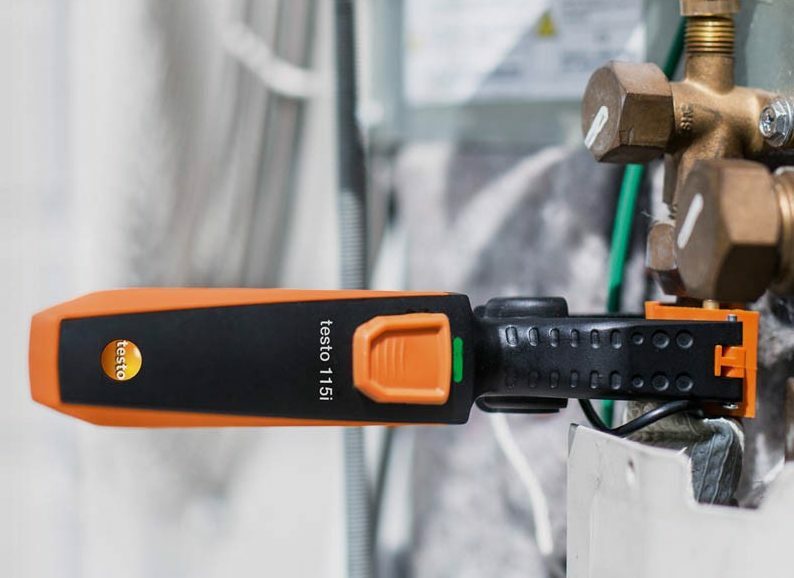 Because the liquid line temperature will often be VERY close to the outdoor temperature on new, high-efficiency system this is often a point where you will measure a liquid line as colder than the outdoor air when that may not really be the case. It is always a good practice to have a backup set of thermometers and gauges so you can double check the calibration of your tools against one another. Whenever possible, test them under the conditions that you are using them. If you have two clamps, place them on the same line right next to one another, when testing two air probes, stick them both in the same return air stream side by side. For temperature measurement you may also test in an ice bath just make sure that the water is pure and that the water and ice are fully mixed and circulating when you test for 32°F(0°C) degrees. Also, keep in mind that every measurement device has “uncertainty” in the measurement of +/- a certain amount depending on the tool. Don’t expect your tools to provide a greater accuracy than what is published in their specifications. First off, if you’ve never heard the term “beer can cold” you are either not in the trade, or you have been living a pretty sheltered existence. I started as a tech apprentice when I was 17 years old and on my first day in the truck my trainer grabbed the suction line of a running split system and said “She’s running good! beer can cold”. Now before you freak out, my trainers were primarily a couple of guys named Jimmy Wells and Dave Barefoot and these old school techs would JOKE about beer can cold and then they would proceed to connect their gauges and properly check superheat and subcooling. There are two things to know about old sayings like “beer can cold” or listening to your vacuum pump or feeling the air velocity out of a register. When I was in trade school my instructor taught me to “feel my way” through the refrigerant circuit to identify the liquid line, suction line and discharge line by touch. This resulted in some minor burns and a perspective on the “qualitative” or intuitive understanding of the refrigerant circuit. Using your senses to hear, feel and smell the system are really important tools an efficient and effective tech builds over time to alert themselves of slipping belts, a vacuum pump that isn’t operating properly, a burned board or transformer, a bad bearing or even… an underfeeding or overfeeding evaporator. This is where “Beer can cold” (grabbing the suction line to get an approximate temperature) isn’t always a bad thing… but only when used as an initial qualitative test. A good diagnostic technician finds THE problem first, whatever is primarily causing the problem is the first order of business. Once that primary problem is identified THEN a good tech moves on to inspecting the entire system and making more measurements as possible to identify additional issues. Once the initial set of know issues have been rectified then a good technician will always verify proper system performance using real measurements that PROVE that the system is operating properly. You cannot charge a system by “Beer Can Cold“. It is nothing more than a long running inside joke that refers to grabbing the suction line and it feeling cold like a beer on a functioning A/C system. Depending on the type of beer and the preference of the drinker, beer can be anywhere from 36°F(2.22°C) for a good old can of American Lager all the way to about 55°F(12.77°C) for a British stout kept at cellar temperature. Craft Beer enthusiasts will tell you that about 45°F(7.22°C) is a good compromise between flavor and temperature. On average your evaporator temperature will have a 35°F(19.25°K)DTD (Design Temperature Difference) which means the coil temperature will be about 35°F(19.25°K)) colder than the return air DB temperature. This means if it’s 75°F(23.88°C) in the return the evaporator will be at about 40°F(4.44°C). We then need to add in superheat which will vary quite a bit on a fixed orifice system. On a TXV or EEV system it will be between 5°F and 15°F(2.75°K – 8.25°K) on a properly functioning system. This means that the suction line indoors could range from 45°F to 55°F(24.75°K – 30.25°K) by the time you account for the TXV superheat range, the uncertainty of the temperature measurement and the variability in DTD. If you are grabbing the suction line outside you will also need to account for anywhere from a 1°F to a 8°F(.55°K – 4.4°K) rise in temperature on the suction line by the time it get’s from the coil to the outdoor unit where “Beer Can Cold” is taken. Now the range is all the way from a acceptable beer temp of 46°F(7.77°C) all the way up to a putrid 63°F(17.22°C) that even the British would find unacceptably warm. I don’t know about you, but my hand is only calibrated to within +/- 4°F(2.2°K), when you add that to the mix I find that using my hand to feel the suction line gives me only the roughest estimation of what is going on and if 50°F(10°C) is the average… that is too warm for my taste in beer anyway. Beer can cold, like most “rules of thumb” is far too inaccurate to be useful (at the risk of overstating the obvious). What I do recommend, is becoming fully familiar with…. As we talked about in an earlier podcast, a TXV is designed to maintain a specified and constant superheat at the outlet of the evaporator coil. It does this through a balance of forces between the bulb pressure (opening force), Equalizer pressure (Closing force) and spring (Closing force). It is the spring pressure that can be adjusted on some valves, but why and when would this be done? For the quick, cut to the chase version, turning the adjustment on the bottom of an adjustable valve clockwise = higher superheat and counterclockwise = lower superheat. However, before you start messing with the adjustment, I suggest you read on. First, the valve must be an adjustable type, many valves on small equipment are not adjustable and have no hex cap at the base. Before an expansion valve can function properly and do its job, it must have a full line of properly subcooled liquid refrigerant all the way to the inlet. On a split system checking the subcooling at the condensing unit is a good start but you also need to make sure there isn’t a significant temperature drop all the way up the expansion valve inlet. Keep in mind that some valves have a screen right at the valve inlet, so a restriction even at that point will cause operational issues. For an expansion valve to function there needs to be a significant pressure differential between the evaporator` design pressure and the liquid pressure entering the expansion valve (In many cases 100 PSIG +). During cooler times of the year the outdoor condensing pressure/temperature may drop to the point that the required difference in pressure may not exist and in these cases, the valve may no longer be able to maintain the target superheat. While low ambient controls may be employed to rectify the issue in some cases, in many cases, you must simply be aware that the valve will not function as expected. Ensure that the bulb is mounted on the suction line flat and tight with a proper strap. It is never a bad idea to insulate the bulb, and anytime it is exposed to ambient air it is a necessity. Now you are at the point where you can consider whether that valve could use some adjustment. First, measure the superheat right at the evaporator outlet in the same general location as the TXV bulb and equalizer in most cases the superheat at that point should be 5-10 degrees but refer to manufacturers specs when in doubt. In some cases, you will not have a pressure port at the evaporator so you must rely on a pressure reading outside. Use common sense when assessing the situation and realize that there may be some pressure drop on a 100′ line set and there should be very little in a 10′ line set. Make some allowance according to the situation. If the system is running VERY low or VERY high suction pressure and /or superheat readings that are way out of range, it is very unlikely that adjusting the valve will remedy it. Usually, valve adjustments are only for small superheat changes up or down. The bulb pressure is the opening force of the valve, so when the bulb is warmer it exerts more opening force resulting in a more “open” orifice, and when it’s cooler it exerts less opening force resulting in a more “closed” orifice. The equalizer is a closing force so the higher the suction line pressure, the more the valve is forced closed and the lower the suction line pressure the more the valve is forced open. The spring is also a closing force and on an adjustable valve increasing the spring tension/force results in lower flow and higher superheat, decreasing the spring tension/force results in more flow and lower superheat. In short, counterclockwise = lower superheat, clockwise = higher superheat. Before you adjust anything, the system must have been running for a good long while, and you have observed that the superheat has stabilized. You then must check the entire system and surmise that everything else is functional, the valve is being provided with a fully liquid, properly subcooled, high enough pressure feed of refrigerant. If at that point you find it is out of range then you can make adjustments. CAREFULLY remove the hex cap from the base of the valve with a properly sized wrench and a backing wrench exposing the adjustment screw. Turn 1/2 turn at a time clockwise (with a refrigeration wrench) to increase superheat or counter-clockwise to decrease superheat. After a 1/2 turn adjustment, replace the panels and allow the system to run and stabilize. 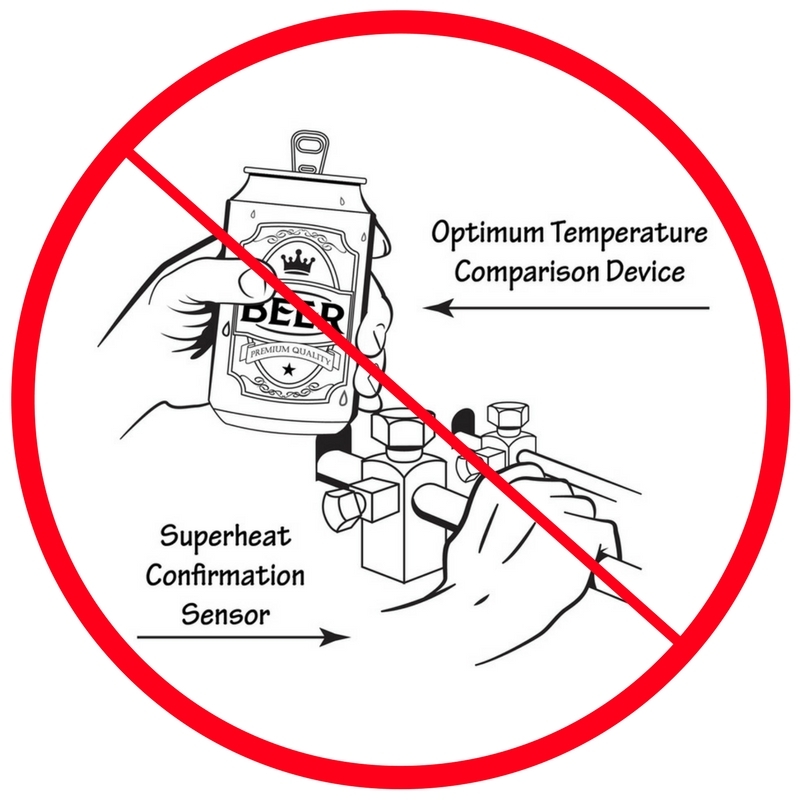 Recheck the superheat and not the change. Repeat as needed until the maximum setting is reached. NEVER force the adjustment screw too far, it should require minimal force to turn other than possibly initially to “unstick” the screw. Adjusting a TXV / TEV is an advanced skill for a technician who has a good grasp on their readings and the forces at play. Tread carefully. The most common and often most frustrating questions, that trainers and senior techs get goes something like this. “What should my ______ be?” or “My _____ is at ______ does that sound right? Usually, when the conversation is over both the senior and junior techs walk away feeling frustrated because the junior tech just wanted a quick answer and the more experienced tech wants them to take all of the proper readings and actually understand the relationships between the different measurements. In this series of articles we will explore the, “What should my _______ be?” questions one at time and hopefully learn some things along the way. So what should the superheat be? First, what is superheat anyway? It is simply the temperature increase on the refrigerant once it has become fully vapor. In other words, it is the temperature of a vapor above it’s boiling (saturation) temperature at a given pressure. The air around us is all superheated! Head for the Hills! We measure superheat (generally) on the suction line exiting the evaporator coil and it helps us understand a few things. First, if we have any reading above 0° of superheat we can be certain (depending on the accuracy and resolution of your measuring tools) that the suction line is full of fully vapor refrigerant and not a mix of vapor and liquid. This is important because it ensures that we are not running liquid refrigerant into the compressor crankcase. This is called FLOODING and results in compressor lubrication issues over time. When the suction superheat is lower it tells us that saturated (boiling) liquid/vapor mixture is feeding FURTHER through the coil. In other words, lower superheat means saturated refrigerant is feeding a higher % of the coil. When the superheat is higher we know that the saturated refrigerant is not feeding as far through the coil. In other words higher superheat means a lower % of the coil is being fed with saturated (boiling) refrigerant. The higher the % of the coil being fed the higher the capacity of the system and the higher the efficiency of the coil. This is why on a fixed orifice system we often “set the charge” using superheat once all other parameters are properly set. Adding refrigerant (on a fixed orifice / piston / cap tube) will feed the coil with more refrigerant resulting in a lower superheat. Removing refrigerant will increase the superheat by feeding less of the coil with saturated (mixed liquid and vapor) refrigerant. This method of “setting the charge” by superheat does not work on TXV / TEV / EEV systems because the valve itself controls the superheat. This does not negate the benefit of checking superheat, it just isn’t used to “set the charge”. Most air conditioning compressors are refrigerant cooled. 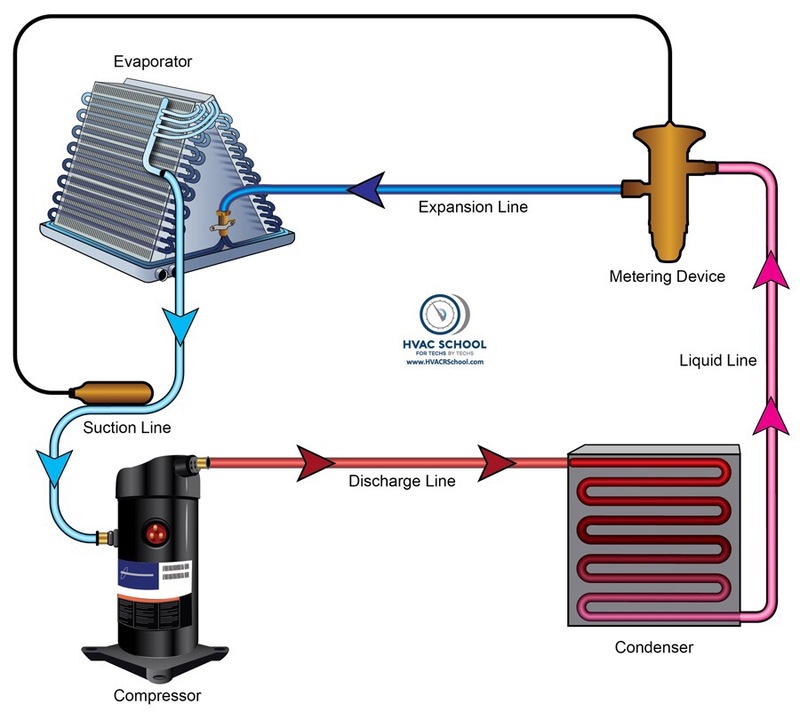 This means that when the suction gas (vapor) travels down the line and enters the compressor crankcase it also cools the motor and internal components of the compressor. In order for the compressor to stay cool, the refrigerant must be of sufficient volume (mass flow) and low temperature. Measuring superheat along with suction pressure gives us the confidence that the compressor will be properly cooled. This is one reason why a properly sized metering device, evaporator coil, and load to system match must be established to result in an appropriate superheat at the compressor. Most “active” metering devices are designed to output a set superheat (or tight range) at the outlet of the evaporator coil if the valve is provided with a full liquid line of a high enough pressure liquid (often at least 100 PSIG higher than the valve outlet / evaporator pressure). Once we establish that the valve is being fed with a full line of liquid at the appropriate pressure we check the superheat at the outlet of the evaporator to ensure that the valve itself is functioning properly and /or adjusted properly. If the superheat is too low on a TEV system we would say the valve is too far open. If it is too high the valve is too far closed. On both TEV / EEV systems and fixed orifice systems (piston / cap tube) you will notice that when the air (or fluid) going over the evaporator coil has less heat, or when there is less air flow (or fluid flow) over the evaporator coil the suction pressure will drop. However, on a TEV / EEV system as the heat load on the coil drops the valve will respond and shut further, keeping the superheat fairly constant. On a fixed orifice system as the load drops so will the superheat. It can drop so much on a fixed orifice system that when the system is run outside of design conditions the superheat can easily be zero resulting in compressor flooding. When the load on the evaporator coil goes up a TEV / EEV will respond by opening further in an attempt to keep the superheat constant. 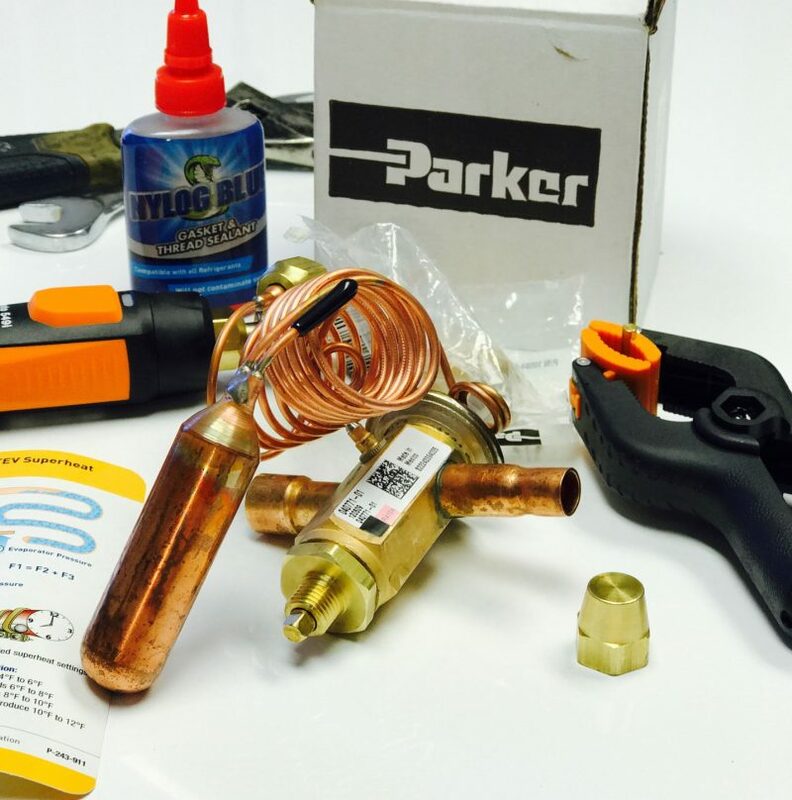 A fixed metering device cannot adjust, so as the heat load on the coil goes up, so does the superheat. Remember, this chart ONLY applies to fixed orifice systems. When setting superheat on a refrigeration system with any type of metering you often must get the case / space down close to target temperature before you will be able to make fine superheat adjustments due to the huge swing in evaporator load. Once again, refer to manufacturer’s design specs.